In the exhibit Unpredicted Motion, BAG member Elizabeth McKee celebrates movement, color, light, books, and angels. The centerpiece of the show is her accordion-folded book, Assault of Angels, which weighs 70 pounds and took her 10 years to complete. 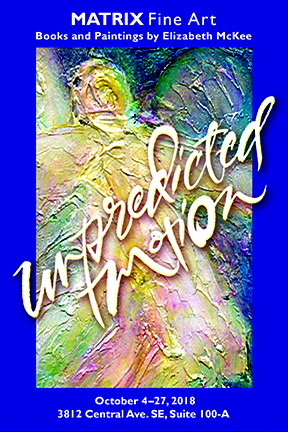 Unpredicted Motion runs from October 4 through October 27 at Matrix Fine Art, 3812 Central Avenue SE, Suite 100-A, Albuquerque, NM 87108; 505-280-8659; matrixfineartabq.com. The opening reception is Friday, October 5, 2018, from 5 to 8 pm. Beth’s artist’s talk is on Saturday, October 20, 2018, from 1 to 3 pm. Beth says, “I would be happy to meet anyone who plans a visit to the gallery; just contact me at alphabeth55@gmail.com.” The gallery’s regular hours: are Thursday, Friday, and Saturday, 11 am to 5 pm. There is free parking behind the gallery at Silver and Solano.